Promo codes are the perfect way to monitor exactly how effective your marketing and advertising efforts are. If you have been pouring money into TV ads, radio spots, social media and other outlets, but you aren’t really sure where your leads and sales are coming from, then it is time to partner with Potenza Auto Dealer to start taking your marketing to the next level. The idea is simple: each advertisement you publish is tagged with a specific promo code that can then be used to track the performance of your marketing and advertising campaigns. Potential customers will visit your site, enter their promo code and navigated to relevant page which you can instantly gather contact information that will help you nurture leads and see exactly which campaigns are driving visitors to your site. 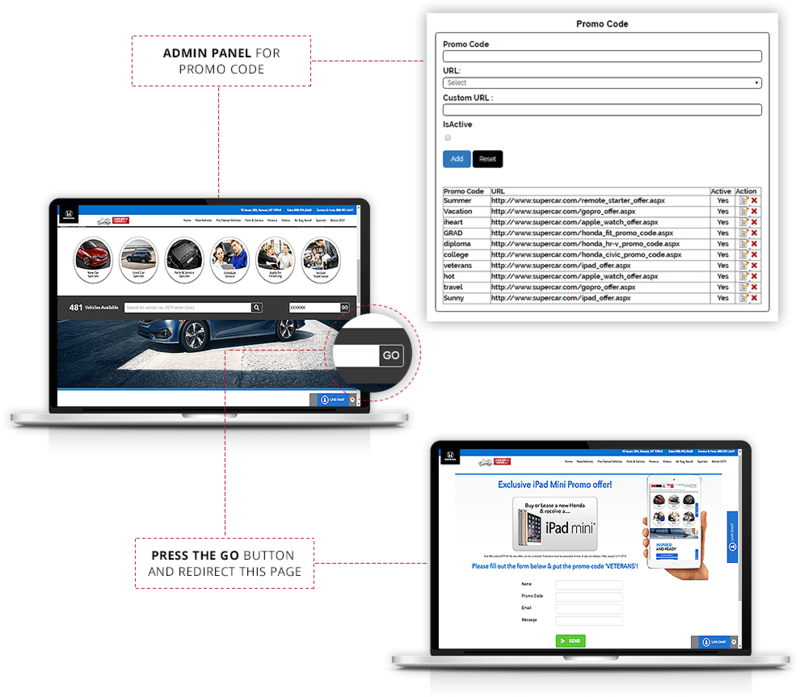 Our package of automotive dealer solutions includes creating promo codes, as well as, attractive and functional landing pages. Form a good impression from the start with outstanding designs that also help you gather valuable data. You can then use this information to decide where you should be investing your advertising dollars in order to enjoy the maximum ROI. Connect with interested customers on their terms and start increasing conversions.